Is This the Superpower of Chatbots? Human conversations drive habits and bots do too. In building and testing our bot at Everist, we’ve applied many habit building principles to drive behavior change. My co-founder Scot goes for a run every afternoon around 3pm. Before he does, he usually says, “hey, I’m going for a run.” I realized recently that just hearing him say those words causes me to get up and get a cup of coffee. Think about that. A person says something and it triggers a physical reaction. I am aware that I usually have an afternoon coffee, but I only noticed it was on cue after hearing a similar habit described in this video. If you work with other people, you might be saying a version of the same thing to the same person every day. Something like: “good morning, Jen.” The next time you do this, try to see what the recipient of your greeting does after you say it. Is your conversation a habit cue for them? If they get few other interruptions to their day, you could be influencing their behavior. Habits are actions that we take without having to consciously decide to take them. The part of the brain associated with habits is called the basal ganglia. It is separate from the part of the brain that makes decisions, the prefrontal cortex. Once you establish a habit, your basal ganglia doesn’t need to consult with your prefrontal cortex before taking action. (For an explanation of this concept, Thinking Fast and Slow by Daniel Kahneman is the go-to). Think about a simple action like turning on the light when you enter a room. You reach for the switch automatically, sometimes even when the light is already on. It’s not a conscious decision. 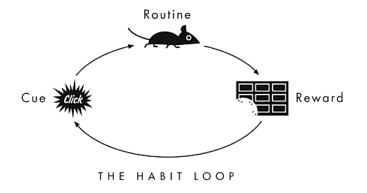 Every habit follows a psychological pattern that Charles Duhigg calls a Habit Loop. Something that serves as the cue, a routine happens without much thinking, then there’s a reward. For turning on the lights, the cue is that it’s dark, the routine is the action of flipping the switch and the reward is that the lights come on. We’re basically rats. Duhigg says, “when a cue and a behavior and a reward become neurologically intertwined, what’s actually happening is a neural pathway is developing that links those three things together in our head.” The reward we get from completing a habit is linked to the cue we get next time it’s time to perform the action. The point of establishing habits is to move as much action as possible to your subconscious mind. It follows that digital products influencing behavior should require little conscious effort. 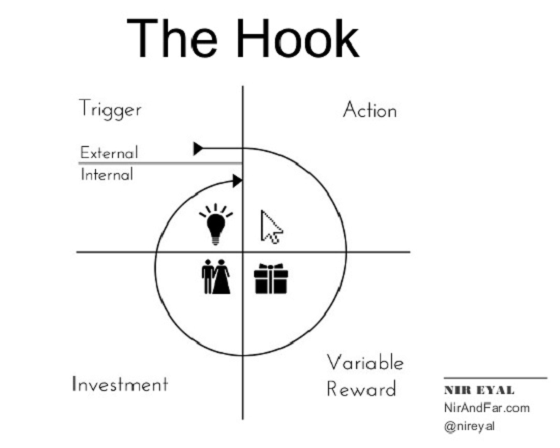 In Hooked, Nir Eyal takes the idea of the habit loop to designing products that become habitual. Nir notably changes “reward” to “variable reward”. Variable rewards are what make Facebook or Pinterest so sticky. After you take the action (in this case to open the app), your reward (seeing your timeline) will never look the same. That unpredictability keeps you coming back for more. Without a strong reward, notifications stop causing you to take action. Nir adds “investment” as the final step in the loop to emphasize the need for strong rewards to drive the next cue. Bots are able to facilitate every part of the Habit Loop/Hook. The most successful bots organically follow this process and have more engaged users as a result. If their end goal is not to build a habit, using the bot becomes the habit. Below are some of the characteristics about bots that make them a useful tool for habit building with examples of bots already helping users build habits. Bots can live where you’re already chatting with real humans like Facebook Messenger or Slack. This makes them more literally accessible in that you don’t have to download another app. But also, everything from the color of the icon and the format of the message makes the interaction feel more familiar, friendly and accessible. This drives a more positive association to the habit cues. 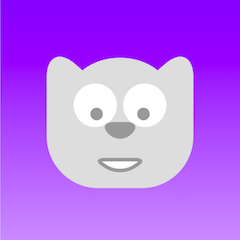 Healthybot on Slack helps you build and track healthy habits at work. 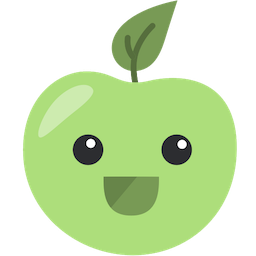 Healthybot lives within Slack which makes you more likely to read the its messages and track your progress without leaving the context of work. Bots should have a personality and feel like a familiar person or character. The personification of the tool helps drive stickiness of the habit. Conversation is a more human way to influence behavior than push notifications, for example. 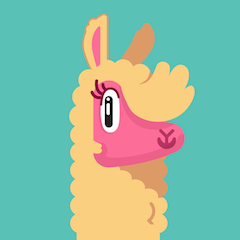 Penny, a bot that helps you build better spending habits, establishes personality really well. She is funny and supportive but her personality doesn’t distract from her function. Chatbots provide the perfect level of accountability. Humans are okay at holding each other accountable, but all relationships also come with lots of confusing context. When we interact with someone, we don’t just focus on the interaction. We are also thinking: “does this person like me”; “do I like this person”; “last week this person interrupted me in a meeting”. There’s a natural level of judgement you feel when you interact with humans. This feeling sometimes drives you to complete an action, but it doesn’t help you to develop a habit. You might try to hold yourself accountable to completing an action habitually. You can do this by using calendar reminders or push notifications, for example. But that experience is impersonal. It’s clear that no one else is seeing your progress or cares. Chatbots have the opportunity to tow this line between I care a little bit what this thing thinks of me because it has a personality and I still know I’m smarter than it and don’t assign any other human baggage to our relationship. It’s the right balance to influence a habit since they are subconscious but also require real action. 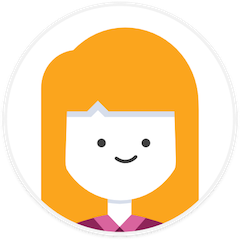 At Everist we’ve built Evie to influence productivity habits like prioritization and reflection at work. Our most interesting find in testing was that people felt MORE accountable to the bot than to a human. The most engaging human conversations are ones where you’re constantly surprised about what you hear. It’s the same with bots. Within a conversational interface, we can provide strong variable rewards that would be disorienting in a visual context. This is as simple as making the user feel heard by understanding their answers. The more unique and customized the rewards get, the deeper the investment the user makes. Joy on Facebook Messenger is a bot that that helps build a habit of reflection. It asks simple questions like, “how are you today?”. The bot runs sentiment analysis on your answers and reflects back to you how you’re feeling. This is surprising and delightful every time. People are more overwhelmed and distracted than ever. With so many constant digital distractions, we spend lots of time trying to decide what to do next. This makes building habits a crucial skill. As we all speculate and try to figure out the right place for bots, habit building is a use case that could be native to the medium. It is a fundamental shift in how we approach behavior change and there are opportunities in every industry to leverage it. Fields as diverse as healthcare, finance and government are already building bots with habits in mind. What do you think? Could this be the superpower of bots? Are there more examples of bots doing this well? Our bot, Evie is in beta on Slack! Our users find it’s a painless way to be more productive and feel good about daily work. Click to join. If you liked this post please hit us with a little ❤ below. Is This the Superpower of Chatbots? was originally published in Chatbots Magazine on Medium, where people are continuing the conversation by highlighting and responding to this story. ← Donjons et Dragons un outil thérapeutique ?